I don’t mean to be cocky, but the chili I made the other night really was the best ever. While beef is usually my protein of choice for this purpose, here in Israel it’s expensive. So I decided to give leaner, cheaper turkey chili a whirl and watched as they freshly ground the turkey breast for me at the shuk. It turned out well. I’ve made a decent amount of chili in my day. We usually make it at least once a year, and have been known to host a chili party. It’s one of those cool weather comfort foods, and when I was home in New York in December I couldn’t seem to get enough of it. Even the Corner Bistro’s chili made from burger and broiler scrapings tasted oh so good. Usually I make a decent chili, but I can get a little heavy-handed. I add too much jalapeno, or beer, or cinnamon. But this time everything was in perfect harmony, the ingredients balanced each other to create a hearty, highly satisfying chili. Also, for the first time I measured and wrote down ingredients as I went instead of haphazardly throwing things in the pot. Which means, lucky for me, I can recreate this again. This is a fairly mild chili, but can be easily spiced up with jalapeno peppers (I just forgot to get them). Enjoy it with a cold beer; the Leffe I cooked with was a perfect complement. Heat a bit of olive oil in a large pot over medium heat. Add the onion, garlic, and red pepper and cook, stirring occasionally, until softened. Add the chili powder, hot paprika, coriander, oregano, and cinnamon; stir and allow to cook until aromatic, 1 minute. Add the ground turkey and cook, breaking up with a spoon, until lightly browned. Pour in the beer and allow to cook down slightly. Add the tomatoes, beans, tomato paste, and spicy paste or hot sauce. Season with salt and pepper. Allow to simmer, uncovered, until thickened, about 20 minutes. Top with sour cream, chopped chives, cilantro, and/or shredded cheese. Gluten free if you use GF beer or omit it entirely. A friend tried it with wine to great success. Kosher meat if you omit the sour cream on top. Looks delicious! Such a hearty comfort food. Thanks Rachel! I’m super excited to have it for dinner tonight. This time doubling it so I have plenty of leftovers! Delicious, even with wine instead of beer to make it Celiac-friendly. Also I didn’t have coriander so I used cumin instead. Rave reviews. 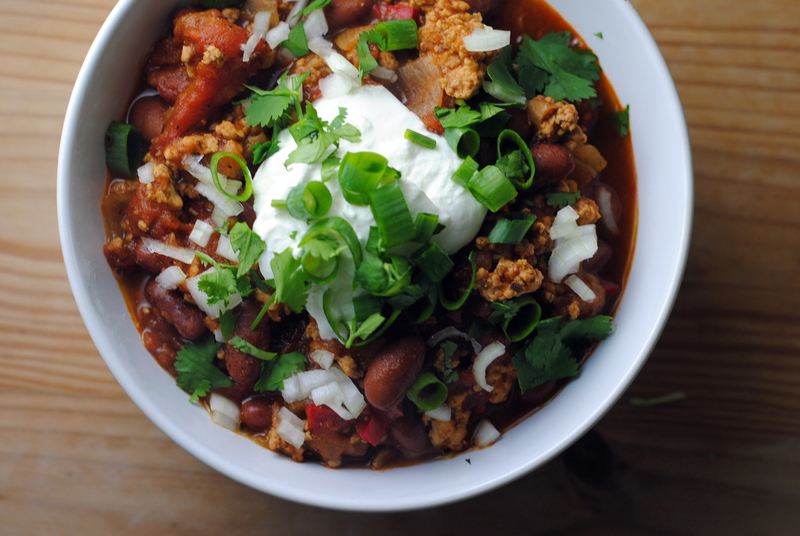 No lie, indeed the best ever turkey chili. Thanks! So glad it came out! Yay! Hope you guys had fun last night.